Dental disease is one of the most common problems in dogs and cats. Untreated dental disease compromises the quality of an animal’s life and leads to pain, infection, tooth loss and potential infection to other organ systems. Dog and cat owners can make a big difference in the longevity and quality of the life of their pets with daily dental care and complete veterinary dental assessment and cleanings. Winter Park Veterinary Hospital utilizes advanced dental equipment including digital radiographs, high speed ultrasonic scaler and fiber optic high speed drill. This equipment allows us to provide thorough dental care including complex extractions and oral surgery. After performing a thorough oral examination and reviewing the radiographs, an individualized dental treatment plan will be discussed with owners. Our doctors are skilled in advanced dental procedures, extractions and surgeries so your pet will be in very good hands. Our preventative, routine dental care includes complete ultrasonic scaling, teeth charting and polishing. 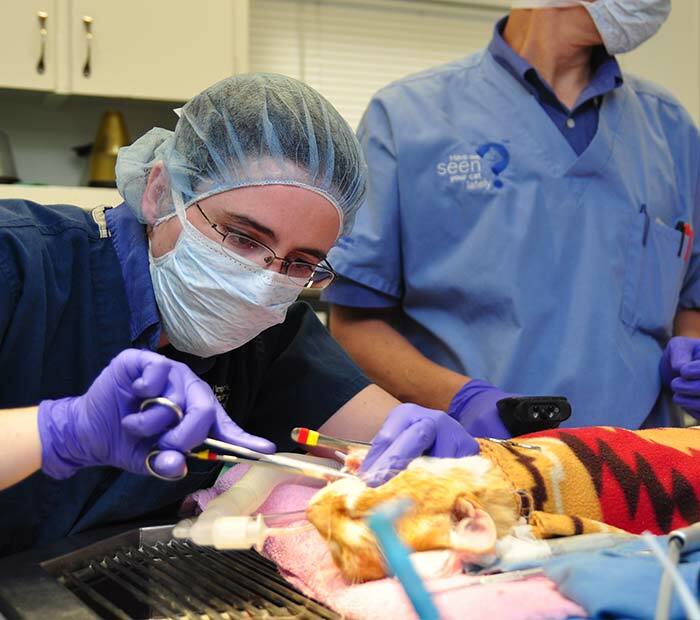 We place your pet under the safest anesthesia and perform a comprehensive oral examination. We examine individual teeth for mobility, fractures, malocclusion and periodontal disease. We remove plaque and tartar using hand instruments and power scaling equipment. We give your pet’s teeth a thorough ultrasonic cleaning and polishing. Your pet will go home the same day. If you have any questions about your pet’s dental health or dental care, please ask us how we can assist you in providing oral care for your pet. Also, we have provided some of the signs of dental disease below. If your pet is experiencing any of these signs or you have concerns about your dog's or cat’s oral health, please contact us to schedule an appointment with one of our veterinarians. Brushing your dog's AND cat’s teeth every day will reduce or eliminate plaque buildup. Plaque, which is an accumulation of bacteria, will progress to periodontitis, which is characterized by pockets of chronic infection, oral pain, and severe infections. Left untreated, it will eventually loosen and destroy the tooth and possibly lead to bone loss. Brushing your pet’s teeth at the same time each day with a pet toothpaste (do not use human toothpaste) and a brushing device (toothbrush, finger brush, gauze on your finger, etc.) is the most effective means of removing plaque from your pet’s teeth. If you have any questions on how to brush your pet’s teeth, please give us a call.